Retooling: Is Leadership The Question Of Control? In the world of church politics, who controls you local congregation? Are you under a strong pastor format where he dictates how God is leading him thus the rest should follow? Does you church “board” wheel in the power checking and directing everything your pastor is or should be doing? Or does your church “board” rubber stamp the pastor’s efforts to show support? Does your pastor surround himself with “yes” men or with men who will “sharpen” him as steel, challenging him, questioning him, yet guiding him and backing him? Does your leadership team “micromanage” everything and everybody, or they free wheeling allowing almost anything to happen? How is one chosen to be on a board: through elections, through appointments, through offices held, through power and influence, through financial contributions? Church is often run like a business, so are their businessmen on the board or just spiritual advisors? “Who really is in control of your church?” That is the question the 21st Century Church has to ask itself, for from the answer to that question will come their whole format, structure, and purpose of leadership. Is the pastor in control? Should he be? Just because you pay a man financially for his efforts does that make him a leader? There is usually one paid staff member for 100 parishioners, volunteers, non-paid participants in a local church. What leadership is in the 99? Pastor/Parish Committees have always been a pain to most pastors, for they can discipline, fire, or turn on any pastor if they wish. Most board meetings, pastor/parish committee meetings, leadership meetings turn into business meetings if the church has allowed itself to become an institution. “Taking care of business” is at the top of the agenda. Is there any other options out there that the 21st Century Church could exam that would be totally different in its effort to “retool” itself. When an industry “retools” itself there is drastic changes: middle level management looses their jobs, workers are furloughed, laid-off, or released. A total restructuring occurs. Like I Corinthians 5:17 records, “the old is gone; the new has come”. The long assembly line of humans is replaced by robotics run by only a few engineers as productivity and profit margins increase, all because of the retooling effort. The financial structures have been attached, re-evaluated, and new priorities in the budget set while lower priorities are cut. The “retooling” process is never a pretty one, nor a pain free one, but usually produces uncertainty, doubt, and opposition at first because it advocates change. So what could cause a violent change in the effort of “retooling” the 21st Century Church, a change that would produce an initial response of uncertainty, doubt, and opposition? I propose that it would be a change in the leadership structure, the leadership paradigm of the pre-21st century era. Usually change comes painfully slow in the institutional church; ask any Roman Catholic. Industry left off the most important part of I Corinthians 5:17, for it reads “If anyone is in Christ, he is a new creation. The old is gone; the new has come.” The secret of “retooling” the Church is found “in Christ”. 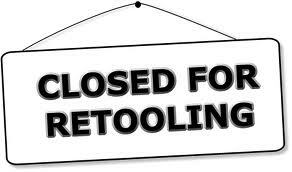 If the “retooling” is not founded in Jesus Christ, it is of no use. I propose to propositions to examine. First, industry brings in an outside C.E.O. to examine the current structure, then hack away at it to retool it, no matter how many jobs are lost, or profits temporarily diminish in an effort to “save the company”. Who is the figure to lead the “retooling” of the 21st Century Church? The Answer: The Holy Spirit!!! But again, as an individual and as a corporate body the question arises: Can we trust the Holy Spirit who will probably slash all the unnecessary structures, mindsets, etc. that we, the church, have accumulated into what we think is “church” today. Again “If anyone [any structure, any program, any position of influence] is in Christ, he [it] is a new creation.” Like industry, those in the current structure who like the old way, the old time religion, will meet these changes with uncertainty at first, then begin to doubt their validity, and finally oppose them. The church has a historical track record of opposing any change. In fact I judge the validity of any renewal or reformation movement by the opposition it gets from the church of its time. Second, the structural change I propose “in Christ” that would be a totally “new creation” would be five fold leadership model of “service” designed to “equip or train the saints” for “the work of service” in an effort to “bring unity to the body” while thirsting and hungering for more “knowledge of the Son of God” in an effort to help every individual believer in Jesus and the Church as a whole to be more “mature” striving for the “full measure of Jesus Christ” in our lives. We need to look at this proposition in more details in up coming blogs to see the effectiveness it would have on the 21st Century Church, and the opposition it will face from the existing church.